Feb. 27, 1920. Maj. R. W. Schroeder sets a world altitude record of 33,114 feet in the Packard-LePere LUSAC-11 biplane over McCook Field. During WW 1, the Air Service began making test flights at high altitude. On Sep. 18, 1918, Capt. 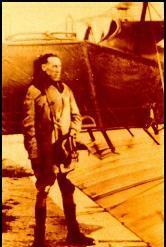 Rudolph W. "Shorty" Schroeder set a world record of 28,900 ft. in a Bristol airplane from McCook Field. In 1919, he established three more world altitude records, and on Feb. 27, 1920 in a LePere airplane fitted with a General Electric turbo supercharger, he reached a world-record height of 33,114 ft. When he removed his goggles to change oxygen flasks in order to continue breathing in the rarified atmosphere, the -63 degree air temperature immediately froze his eyeballs.